We are a warm and welcoming practice that takes pride in ensuring everyone receives a service which is personal and friendly and offers expertise and professionalism. Our team are always on hand, should you need advice to find what suits your individual eye care requirements. As an independent practice, we know the importance of traditional values. We have many patients who have been with us for many years, but we also love seeing new faces at the practice and welcome new patients. Our double door entrance makes us wheelchair friendly or for anyone with double child buggies. All our equipment and eye examination rooms are on the ground floor for easy access for everyone. We consider continuity of eye care, customer satisfaction and after sales service to be essential features of our practice. The British College of Optometrists recommends that it is advisable to have your spectacles dispensed where you have your eye examination, so any aftercare required will be dealt quickly and without any inconvenience to yourself. We collect old spectacles for Vision Aid Overseas, which will benefit people in less developed countries to gain better sight, and in your knowledge that your spectacles have been put to good use. Anil opened Eye Design in 1990. Having worked across a breadth of independent practices in and out of London, he accrued enough industry experience and knowledge to open his own practice. As his reputation grew within the Ruislip community, and further afield, his practice also grew, and is now well-established in the North West London area. 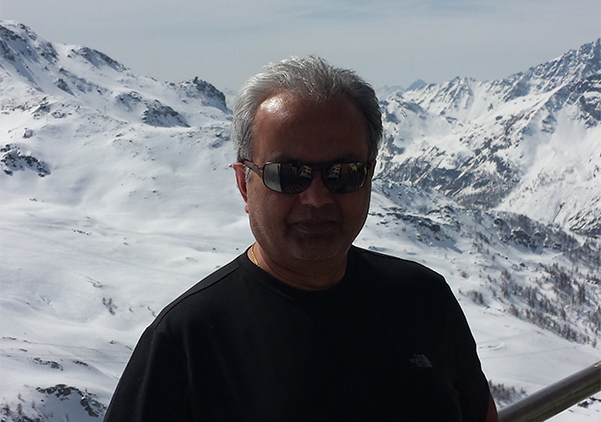 Anil enjoys wildlife and landscape photography, walking, and is an avid Trekker, having twice climbed Mt Kilimanjaro, reaching the Everest Base Camp, completing the Machhu Pichhu Inca Trail, and trekking over the Atlas Mountains (to name but a few!). He has a passion for the culinary arts, and is actively involved with various charitable bodies.